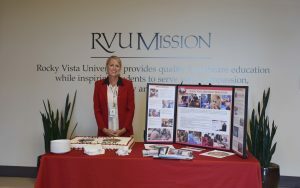 Rocky Vista University’s (RVU) Institute of Medical and Surgical Simulation held a day of celebration during Healthcare Simulation Week on September 19th. Created by the Society for Simulation in Healthcare, the event celebrated the accomplishments of RVU’s Simulation Program, as well as the professionals who use simulation to improve the safety, effectiveness, and efficiency of healthcare services every day. Dr. Susan Carter hosts an information booth for Healthcare Simulation Week. 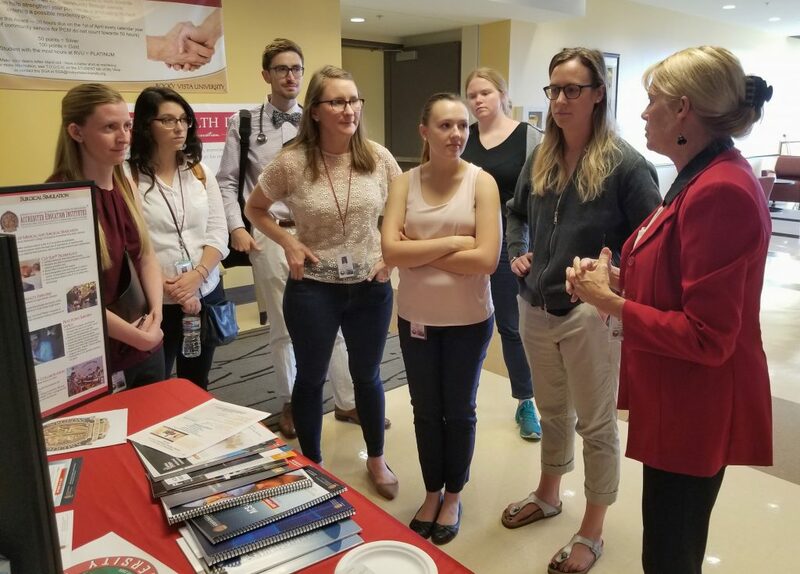 Led by Susan Carter, MD, Director of the Institute for Medical and Surgical Simulation, the event allowed students, faculty and staff to learn about upcoming projects and the role of simulation in healthcare education. As part of RVU’s program offerings, healthcare providers including medical students, physician assistants, surgery residents and first responders are able to practice surgical skills, deliver babies, learn heart murmurs, and respond to emergency situations using disaster and mass casualty simulations. RVU employs the use of the Cut Suit®, a human-worn body suit with interchangeable parts and organs that simulates highly realistic trauma. RVU’s Simulation Program also features the Standardized Patient Lab where students can practice and develop their communication and clinical skills with standardized patients (actors who portray realistic scenarios or symptoms). In addition to providing an extensive educational opportunity for students, RVU’s comprehensive simulation center offers the CPEP program, a service that helps professionals demonstrate competency and address opportunities for improvement in an effort to return to clinical practice. “The Institute of Medical and Surgical Simulation has placed us as leaders in the industry with limitless possibilities for the future,” said Dr. Carter. Simulation incorporates various methods and techniques aimed at improving patient safety. When applied in healthcare education, it gives students the opportunity to learn from their mistakes in a controlled environment and boosts their confidence as future medical practitioners. As the only osteopathic medical school to receive accreditation as a Comprehensive Education Institute with the American College of Surgeons, RVU is able to offer cutting-edge technology and innovative programs to advance simulation in healthcare education and beyond.